(Nanowerk News) Physicists at the National Institute of Standards and Technology (NIST) have demonstrated the first "universal" programmable quantum information processor able to run any program allowed by quantum mechanics—the rules governing the submicroscopic world—using two quantum bits (qubits) of information. The processor could be a module in a future quantum computer, which theoretically could solve some important problems that are intractable today. The NIST demonstration, described in Nature Physics, marks the first time any research group has moved beyond demonstrating individual tasks for a quantum processor—as done previously at NIST and elsewhere—to perform programmable processing, combining enough inputs and continuous steps to run any possible two-qubit program. The NIST team also analyzed the quantum processor with the methods used in traditional computer science and electronics by creating a diagram of the processing circuit and mathematically determining the 15 different starting values and sequences of processing operations needed to run a given program. "This is the first time anyone has demonstrated a programmable quantum processor for more than one qubit," says NIST postdoctoral researcher David Hanneke, first author of the paper. "It's a step toward the big goal of doing calculations with lots and lots of qubits. The idea is you'd have lots of these processors, and you'd link them together." The NIST processor stores binary information (1s and 0s) in two beryllium ions (electrically charged atoms), which are held in an electromagnetic trap and manipulated with ultraviolet lasers. Two magnesium ions in the trap help cool the beryllium ions. NIST scientists can manipulate the states of each beryllium qubit, including placing the ions in a "superposition" of both 1 and 0 values at the same time, a significant potential advantage of information processing in the quantum world. Scientists also can "entangle" the two qubits, a quantum phenomenon that links the pair's properties even when the ions are physically separated. With these capabilities, the NIST team performed 160 different processing routines on the two qubits. Although there are an infinite number of possible two-qubit programs, this set of 160 is large and diverse enough to fairly represent them, Hanneke says, making the processor "universal." Key to the experimental design was use of a random number generator to select the particular routines that would be executed, so all possible programs had an equal chance of selection. This approach was chosen to avoid bias in testing the processor, in the event that some programs ran better or produced more accurate outputs than others. Ions are among several promising types of qubits for a quantum computer. If they can be built, quantum computers have many possible applications such as breaking today's most widely used encryption codes, such as those that protect electronic financial transactions. In addition to its possible use as a module of a quantum computer, the new processor might be used as a miniature simulator for interactions in any quantum system that employs two energy levels, such as the two-level ion qubit systems that represent energy levels as 0s and 1s. Large quantum simulators could, for example, help explain the mystery of high-temperature superconductivity, the transmission of electricity with zero resistance at temperatures that may be practical for efficient storage and distribution of electric power. The new paper is the same NIST research group's third major paper published this year based on data from experiments with trapped ions. 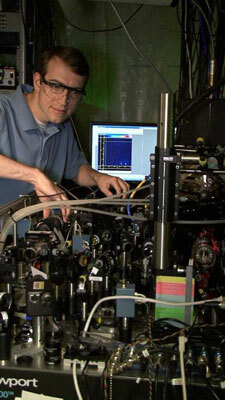 They previously demonstrated sustained quantum information processing (http://www.nist.gov/public_affairs/releases/ ion_trap_computers080609.html) and entanglement in a mechanical system similar to those in the macroscopic everyday world (http://www.nist.gov/public_affairs/ releases/jost/jost_060309.html). NIST quantum computing research contributes to advances in national priority areas, such as information security, as well as NIST mission work in precision measurement and atomic clocks. In the latest NIST experiments reported in Nature Physics, each program consisted of 31 logic operations, 15 of which were varied in the programming process. A logic operation is a rule specifying a particular manipulation of one or two qubits. In traditional computers, these operations are written into software code and performed by hardware. The programs did not perform easily described mathematical calculations. Rather, they involved various single-qubit "rotations" and two-qubit entanglements. As an example of a rotation, if a qubit is envisioned as a dot on a sphere at the north pole for 0, at the south pole for 1, or on the equator for a balanced superposition of 0 and 1, the dot might be rotated to a different point on the sphere, perhaps from the northern to the southern hemisphere, making it more of a 1 than a 0. Each program operated accurately an average of 79 percent of the time across 900 runs, each run lasting about 37 milliseconds. To evaluate the processor and the quality of its operation, NIST scientists compared the measured outputs of the programs to idealized, theoretical results. They also performed extra measurements on 11 of the 160 programs, to more fully reconstruct how they ran and double-check the outputs. As noted in the paper, many more qubits and logic operations will be required to solve large problems. A significant challenge for future research will be reducing the errors that build up during successive operations. Program accuracy rates will need to be boosted substantially, both to achieve fault-tolerant computing and to reduce the computational "overhead" needed to correct errors after they occur, according to the paper. Reference: D. Hanneke, J.P. Home, J.D. Jost, J.M. Amini, D. Leibfried & D.J. Wineland. 2009. Realization of a programmable two-qubit quantum processor. Nature Physics. Posted online Nov. 15.